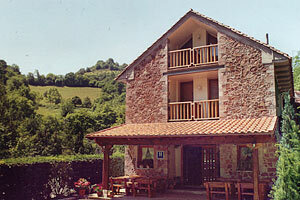 The Salmonera Hotel is located in Cangas de Onís, by the banks of the River Sella. It is a small and comfortable hotel, ideal for spending a quiet weekend. The hotel derives its name from a salmon fishing weir (called a "salmonera" in Spanish) located on the River Sella, Spain’s premier salmon fishery (there’s plenty of sea and brown trout too!). General Franco's was a keen angler and the weir was his favourite fishing retreat. Click here for a great view of the river Sella. 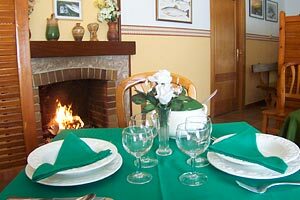 In the Salmonera Restaurant, you will enjoy authentic regional cuisine . Our home made dishes will make you feel right at home. On the menu: minute steak covered with locally produced cabrales blue cheese and washed down with Asturias's famous organic cider. We have a quiet coffee bar, a general living room with a TV set, and a free parking area in order to forget about the car. The fishing starts 30 seconds from the hotel door. It is ideal for resting, fly fishing or practising any other type of activity, including canoeing, walking, mountain biking, and horse riding and taking advantage of the possibilities offered by the River Sella, the Picos Mountains and the surrounding area. If you tell us, we can arrange the necessary fishing licence for our clients in order to fish in Asturias's rivers - there are five big salmon and trout rivers to choose from. And if you want to, we can supply you with a professional fishing guide. Ask us for Holy Week, long weekend or August. Or telephone, +44 (0) 791 5581854. When deciding on places to go fly fishing for Atlantic salmon in Asturias, northern Spain, to celebrate an anniverary or birthday, the luxury Parador hotel at cangas de Onis is worthy of consideration. Click here to view the Parador's outstanding views of the River Sella.